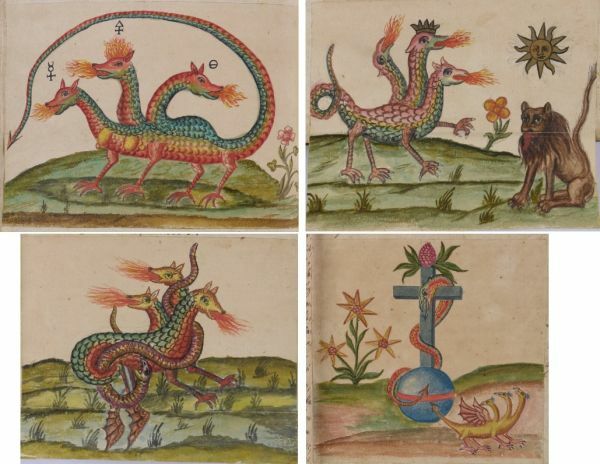 We will take a look at some of the ways in which the triple headed snake or dragon appears in alchemical emblems. The first we consider is a triple headed dragon-serpent found in a manuscript in the Manly Palmer Hall collection in Los Angeles. The heads are coloured red, yellow and black, as with the example we looked at in the discussion topic 'Symbolic and physical alchemy', but here the dragon-serpent lies on its back and seizes its own tail forming an ouroboros. This is similar to the image we examined in the discussions on 'Heraldry in the Book of the Holy Trinity' and the 'Alchemical image in a German almanac'. Although these may be the same image they may mean different things in the context of the emblem in which they appear. The only way we can get some grasp of the meaning is to look at whole emblem and its context and not merely focus on the individual symbol. Here, a cross arises out of the belly of the dragon-serpent, but though this cross incorporates the three coloured elements found in the heads, these are not fused and blended together but appear as patches. 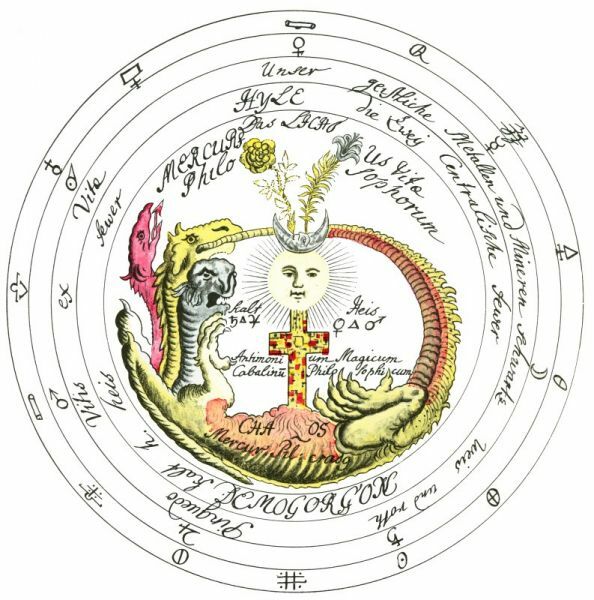 The dragon-serpent is named 'Demogorgon', a constructed word which can mean a terrible infernal deity, or perhaps here the 'dark spirit of the Earth', and this is being contrasted with the word 'hyle' set at the top of the circle enclosing these images. Hyle is the Aristotlean concept of a fundamental, undifferentiated matter, the alchemical prima materia. The dragon-serpent's belly bears the word 'Chaos' and is associated with the mercury of the philosophers. To the left of the cross are the planets or metals Saturn and Jupiter, while to the right we find Venus and Mars associated with heat. On top of the cross is a sun with a lunar crescent set above this, which together with Mercury below completes the seven planetary metals. There is a text just above the belly of the dragon-serpent which states 'The magical, cabalistical, and philosophical antimony'. From the lunar crescent two flowers grow, a rose and a lily. These are likely to be the two alchemical tinctures, the red and the white. Immediately above them we see the text 'The living mercury of the philosophers'. These symbols are set in a circular space, around which are four further circles. The first bears the phrase 'the two cabalistic fires , the cold and hot fires'. The next circle has the phrases 'Our spiritual metals and minerals, black, white and red' and 'The oil and wine of life'. The third circle bears the symbols of the seven planets, while the outer one has fourteen graphic symbols for alchemical substances, including that of arsenic, vitriol, sulphur, salt, spirit of wine, tartar, and so on. Having reviewed the structure of the imagery it seems obvious that this emblem is intended to be read from below upwards. From the chthonic depths of the Demogorgon, the chaos of the four elements, the three headed alchemical dragon seizes its own tail, turning in upon itself and bringing together the disparate elements to form the cross out of which ultimately the red and white tinctures will form. A well known example of the triple headed dragon is found in the Splendor solis. The heads are coloured white, red and black. In the early 16th century illuminated manuscripts of the Splendor solis, this image is part of a series of seven that appear in niches and each are associated with one of the planets, whose attributes are shown in the figures surrounding each niche. Here the image is quite simple, however it must be seen within the context of these planetary flasks, and indeed also within the greater sequence of the 22 emblems that constitute the Splendor solis. Here we see the seven flasks of the Splendor solis series. In this the triple-headed dragon sits within a process going from a stage associated with Saturn, through Jupiter, Mars, the Sun (the triple headed dragon), then to Venus, Mercury and finally the Moon. We note the appearance in the second emblem of three birds coloured red, white and black, which in the third emblem has become a three headed bird. Our image follows this. Its significance must be read as just one stage of this process. This cycle of seven is again embedded in the more complex sequence of 22 images. So we must here view this image as part of a larger emblematic structure. 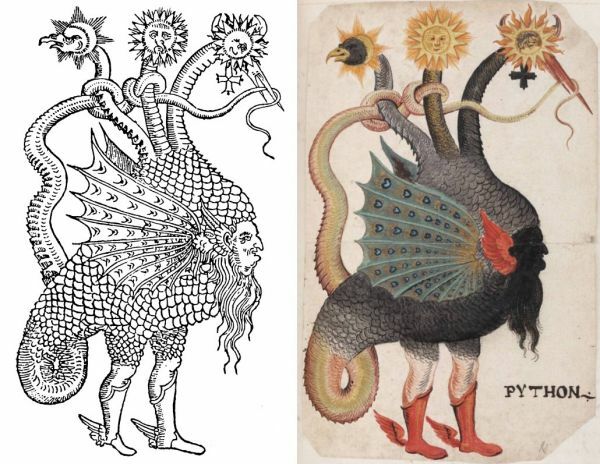 Another perhaps not so well known image of this triple-headed dragon is an illustration in Nazari's extended alchemical allegory the 'Three Dreams on the Transmutation of Metals', printed in 1599. In this case we have quite another conception of this alchemical emblem. "Listen, see, and understand my words; and write them deep in your heart: for what I shall tell you is that which many seek, but few find; and many know and do, but few comprehend; for many see me, but few recognize me. Listen now, and understand if you can, and you will learn all: I am the Hen, or the worst and most ferocious Dragon, and I endure throughout time. I revive myself from death, and kill the death that killed me. I resuscitate the corpses that I created; and, living in death, kill myself: for which you should rejoice, since without me, and my life, you could not rejoice. I carry poison in my head, but the remedy is in my tail, which I bite in my fury. Whoever tries to sport with me dies by my penetrating gaze. Whoever bites me must first bite himself; if I bite him, death bites him in the head, unless he bites me first; for my bite is medicine for my bite. It is in the high mountains that I find my rest and repose, yet it is in the plains and valleys of the earth, and in the dunghills, that I reside; it is in the vaporous water that I am conceived, yet it is in the air and fire that I find my food. My sweat smells of the grave: he who does not understand this will learn nothing of me. Hear me: I am known to all people, races, and tribes, to the poor as well as to the rich; and they all call me worthless, and countless other names and epithets. But anyone who knew me well would call me precious indeed. I am a stranger in my own country, but known to all climates of the world. Whoever sees me, or has seen me, does not recognize me; and whoever neither sees nor knows me, seeks me. My father and my mother conceived me, but I first conceived them. I am father and son; I am mother, father, and son; I am invisible when I fly, and impalpable when I flee through the air, but visible and palpable to the touch. Therefore recognize me, and kill me, and know that I cannot die by the sword, or other arms; but present me with a mirror, and my own reflection kills me. If you feed me in fire, so that first my members change shape; and then my body is purged of all fatal poison; and then you see my body, soul and spirit joined together; then you will prove superior to all. He who hears me, but does not understand, consumes his days in useless labors, and employs his time to no purpose." So we realise when we see the context within Nazari's allegory, that here we have yet another idea expressed through this triple-headed dragon image. Here is the woodcut from the printed book alongside a coloured image in one of the Mellon manuscripts in Yale. 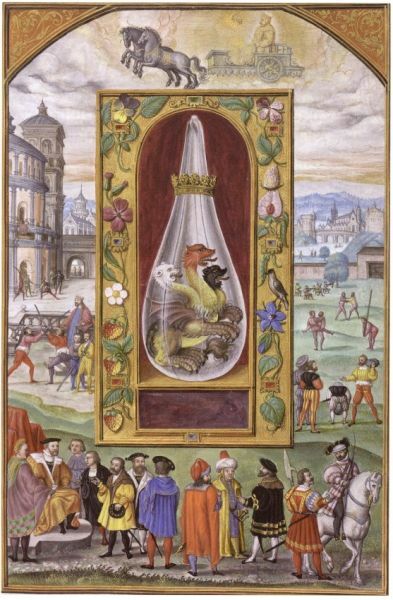 'The Key to the Art by the famous Jew and Rabbi Zoroaster', is an alchemical work of the late 17th or early 18th century. It exists in three manuscripts and there is a printed partial version without illustrations issued in 1738. It contains a menagerie of triple-headed dragon-snakes. Here are some of the 30 emblematic watercolour drawings from the manuscript in Trieste. It is difficult to interpret these without having access to the text, but we can see that these cannot be directly associated with the other appearances of this emblem we have been looking at. There is no simple look up dictionary of alchemical symbols with their meanings. Each work must be read out of itself.